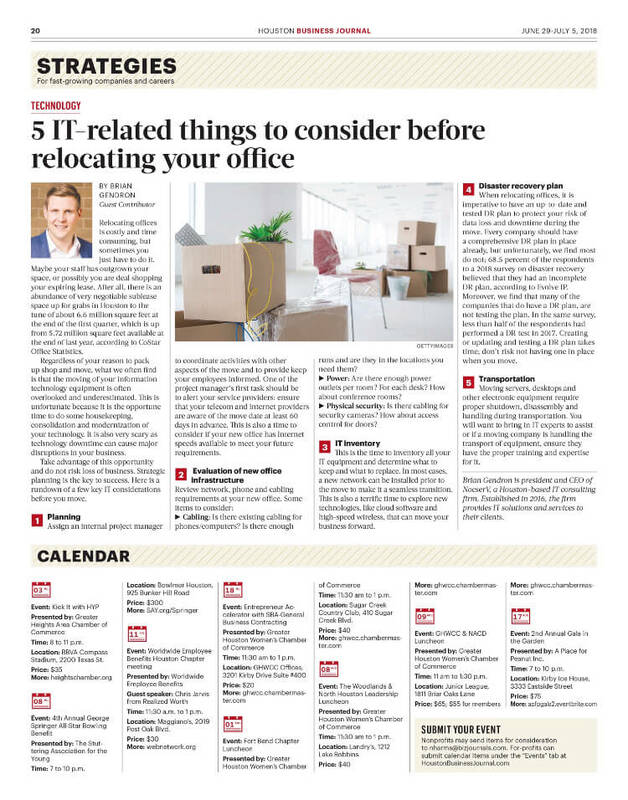 Featured in the Strategies section of the June 29 – July 5, 2018 Issue of the Houston Business Journal. Relocating offices is costly and time-consuming, but sometimes you just must do it. Maybe your staff has outgrown your space, or possibly you are deal shopping your expiring lease. After all there is an abundance of very negotiable sublease space up for grabs in Houston to the tune of about 6.6M square feet at the end of Q1 2018, up from 5.72M square feet available at the end of Q4 2017. Regardless of your reason to pack up shop and move, what we often find is that the moving of your IT equipment is often overlooked and underestimated. This is unfortunate because it is THE opportune time to do some housekeeping, consolidation, and modernization of your technology. It is also very scary as technology downtime can cause major disruptions in your business. Assign an internal project manager to coordinate activities with other aspects of the move and to provide keep your employees informed. One of the project managers first task should be to alert your service providers: ensure that your telecom and internet providers are aware of the move date at least 60 days in advance. This is also a time to consider if your new office has Internet speeds available to meet your future requirements. Cabling: Is there existing cabling for phones/computers? Is there enough runs and are they in the locations you need them? Power: Are there enough power outlets per room? For each desk? How about conference rooms? Physical security: Is there cabling for security cameras? How about access control for doors? This is the time to inventory all your IT equipment and determine what do you keep and what can be replaced. In most cases, a new network can be installed prior to the move to make the move a seamless transition. This is also a terrific time to explore new technologies like cloud software and high-speed wireless that can move your business forward. When relocating offices, it is imperative to have an up to date and tested DR Plan to protect your risk of data loss and downtime during the move. Every company should have a comprehensive DR Plan in place already, but unfortunately, we find most do not; 68.5% of the respondents to a 2018 survey on Disaster Recovery believed that they had an incomplete DR plan. Moreover, we find that many of the companies that do have a DR plan, are not testing the plan. In the same survey less than half of the respondents (48.5%) had performed DR test in 2017. Creating (or updating) and testing a DR Plan takes time, don’t risk not having one in place when you move. Moving servers, desktops and other electronic equipment require proper shutdown, disassembly and handling during transportation. You will want to bring in IT experts to assist here or if a moving company is handling the transport of equipment, ensure they have the proper training and expertise for it. Brian Gendron is president and CEO of NocserV, a Houston-based IT consulting firm. Established in 2016, the firm provides IT solutions and services to their clients.